It makes old Fiddlefreak proud that his adopted home state can produce an artist of this caliber. 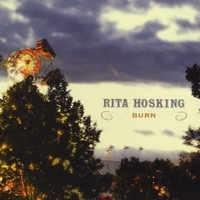 Rita Hosking is a singer-songwriter from Northern California whose music falls into a very sweet spot: nestled comfortably between folk, country, and bluegrass (previously reviewed here). Her new record Burn expands and builds upon previous releases by adding a little more rock swagger and alt-country twang to her solid acoustic foundation. She has an incredible voice. What a talented musician. I really enjoyed that first song, Something You Got. I get alot of the inspiration for my music from music with soul like this! Bluegrass, a banjo.. all I need is some sweet tea. Reminds me of home.